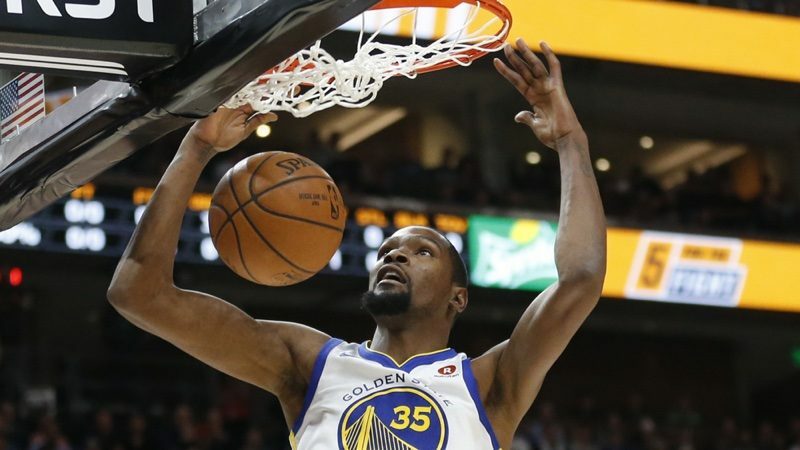 Apple is developing a new drama series that's based on the early life and career of NBA star Kevin Durant, who plays for the Golden State Warriors, reports Variety. The show, called "Swagger," was inspired by Durant's experiences as a youth playing basketball. It will highlight the world of Amateur Athletic Union (AAU) basketball, taking a look into the lives of players, their families, and coaches. Imagine Television, led by Brian Grazer and Ron Howard, will produce alongside Kevin Durant's Thirty Five Media. Both Durant and Grazer will serve as executive producers, while Reggie Rock Bythewood will write and direct. Bythewood is known for his work on "Notorious," a movie that shared the story of Notorious B.I.G., and television series "Shots Fired." Apple now has at least 10 television shows in the early stages of development, including an untitled morning show drama starring Jennifer Aniston and Reese Witherspoon, an "Amazing Stories" reboot from Steven Spielberg, an untitled space drama from Battlestar Galactica creator Ronald D. Moore, a series written by "La La Land" creator Damien Chazelle, a Kristen Wiig comedy series, See, an epic world-building drama, Home, a docuseries focusing on incredible homes, and "Little America," an anthology series from "The Big Sick" creators Kumail Nanjiani and Emily V. Gordon. More details about each of Apple's television projects can be found in the original content section of our Apple TV roundup. Awesome. More content very few care about. Focus on what you're actually good at. This is an Eddie Cue vanity project, isn't it? Would Durant be getting this show if he weren't on the Warriors? Maybe it's just me, but the rumors thus far of shows that Apple is working on just don't seem that interesting. Apple certainly has their work cut out for them to try and pull my attention away from Netflix and Amazon Prime original programming. There isn't a single TV show deal I've cared about that is potentially coming to Apple Music...and as a fanboy, this puts me in a really awkward position. I've owned, used, sold or at least experienced everything Apple has made since 1999. Every product I've touched and used a bit from every iPhone, Laptop desktop and even iPod Socks, Mighty Mouse and the shirts, mouse pads and coffee cups they sell in Cupertino. Heck, I even was a MobileMe and itools subscriber.....with this new service, traditionally I'd watch everything Apple produced because I love Apple. I'm in a tough situation. I basically have to accept that Apple is now doing things that have zero appeal to me and I have to emotionally check out from that. I know new Apple customers don't have that same experience but anyone that's been around long enough to go to 5+ years of Macworld, join a Mac User Group or camp out for Mac OS releases knows that it's a weird feeling when you're no longer the target demographic. Apple the media company and I are going to be in a strained relationship because they're not making things for me and I need to be okay with that. Apple just keeps making this easier for me to not subscribe to their tv content. Not a single show they have in the works interests me in the least. I know exactly how you feel, but with this particular case I'm not sure they know who they're target demographic is either. They obviously think they do, but all of these media efforts seem absolutely aimless and uninformed so far. I'll admit I don't use my Apple Music account for video content of any kind, but I can't think of a single person I know that would watch anything described so far. I guess we'll see one way or the other. True - but there is some validity to the thought that Apple is simply spreading their sphere of concern too widely. Yes, chasing new markets when your 'house' isn't in order is a fools errand. But the management is the same. We know that Apple management can't walk and talk at the same time, because of the way they abandoned products, both hardware and software, without so much as a second thought. Its like they can't be bothered. With regard to software they can't be bothered to get it right before launch and we cannot expect them to get it right later because everyone at the top will be focused on TV programs, meeting the stars, and being part of pop culture. This is Cook's legacy, all the interviews, TV programs, etc. He could care less about software quality. They can't be bothered because the money is still rolling in. They don't realize that all it will take is one bad quarter for things to start unraveling. [USER=201384]@adamjackson[/USER] I hear you man - Same boat here.. I feel like when Apple dropped the "computer" part from their company name is when the break began in earnest and us long timers are more and more getting left in the past.